My name is 'food' spelt backwards because that is all I think about, in fact I'm thinking about it right now. I used to race under the name 'Last of the Line' and even managed to win one. 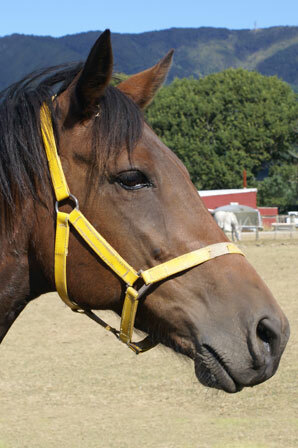 I did endurance riding after my racing career finished. I graciously decided to let Genna and Kerrin borrow my skills for pulling a sulky (a type of carriage) so they could finish the last three months of their trek. This was because Kerrin couldn't ride anymore. 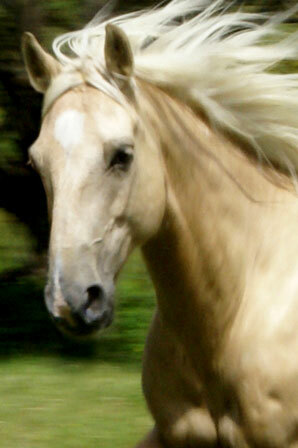 I am a 6 year old Palomino Stationbred. 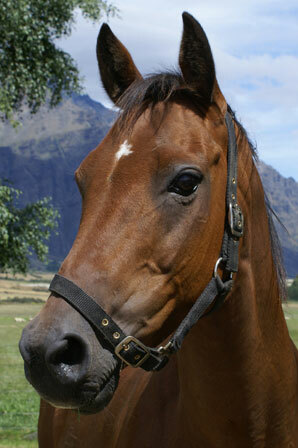 I used to trek for Hurunui Horse Treks in the beautiful mountains. Some people say I am a real trooper! If I get too hot, I just go and stand in a trough to cool down, much to the annoyance of the other horses. I went all the way around the South Island and spent a day in Wellington City before being rested back in Auckland. I was proud and excited to be brought back for the last day of the trek along with Chocolate. My nick name is Snappy because I have mood swings. I snap my teeth a lot but I never actually bite. 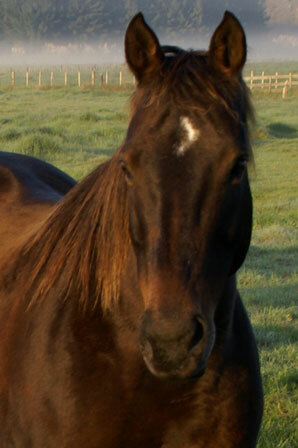 I am a 13 year old and my breed is Quarterhorse Arab cross. I don't understand what slow is, so I managed to make up heaps of time for Kerrin and Genna. Charlie T and I are best mates and we conquered the South Island together. I had been raised on flat ground all my life so when I got up into the mountains in Kaikoura it blew my mind. I didn't know how to walk on sloping hills and I found it a real challenge. I think I am better at it now. I am a 5 year old thoroughbred. I didn't even do a single day's ride on the trek as I acted like a real brat in protest of being somewhere new, with humans I didn't know. I kept this up until I was sent back home and resorted back to my good behaviour. I am 7 years old. 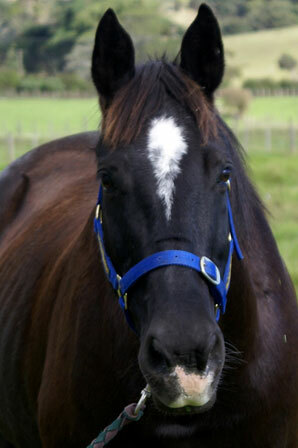 I am a Clydesdale Stationbred cross. I love my food and can be a bit of a vacuum cleaner when I am eating. I can jump full wire fences and I even jumped out of my stall from a stand-still. I did a very big part of the trek until I found a family who I liked so I refused to leave. I am now doing show jumping which is what I prefer doing. Plus I have fallen in love with their mare, Sass. I am 14 years old. 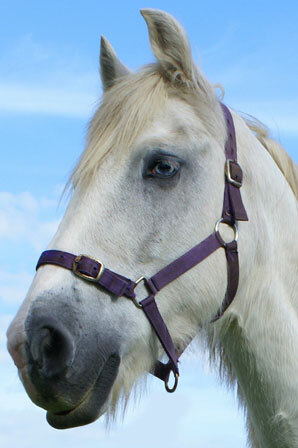 I am a Clydesdale Pinto cross, with blue eyes and white hair. Some people say I look majestic but me... I am just a regular guy. I used to be used for pig hunting so I am used to going bush. My special talents include eating two carrots at once or storing carrots in my mouth for later consumption. Nothing frightens me, except for myself (like putting my foot down and it makes a noise). I started the trek and when I got to the South Island I got arthritis so Kerrin and Genna sent me back to be with Charlie and Xena in Auckland. I am the only one of the originals that made it to the South Island. 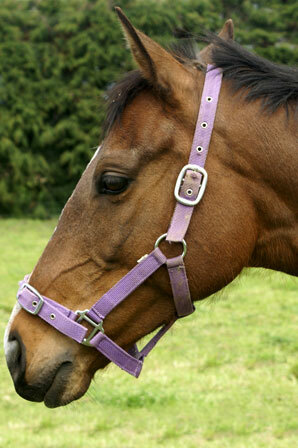 I am a quarter horse cross thoroughbred. I have known Genna since she was fifteen. I used to have a fear of letter boxes and I still haven't overcome my mortal fear of cows. I did the first part of the trek from Cape Reinga to Wellington, but I started to find walking on the hard roads too difficult, so I went back to Auckland to be with Charlie. 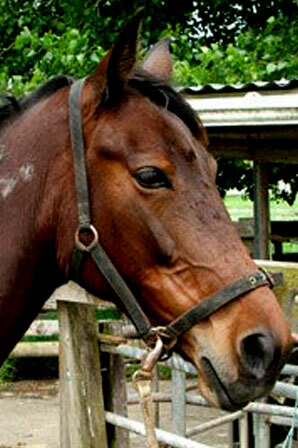 I'm a Standardbred Pacer but there is nothing standard about me. I'm 26 and have more energy than a colt and am the fastest of all the horses. Kerrin is my best mate. I used to race under the name of Leenrow. I had 19 races and came first four times, second twice and third three times. I started the trek at the top of New Zealand and finished once we got back to Auckland because I have trouble standing in floats. I am glad that all my friends are now back with me again. I even have two new friends, Charlie T and Chocolate. I must remember to ask Kerrin how he managed to find another Charlie! 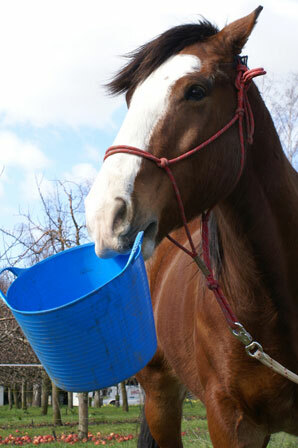 I am a 9 year old Clydesdale cross who used to work for a trekking company. I thought that it would be funny to not get on the truck and then they left without me. Genna and Kerrin obviously don't get my sense of humour. I have worked through my trucking issues now that the trek is over. 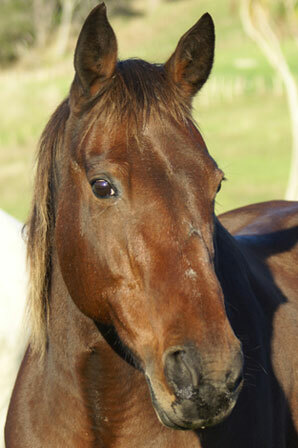 I am a 7 year old Standardbred who is misunderstood. So what if I chase people over cliffs with my mouth slashing wildly? Which reminds me... check out my awesome buck on the preparation video! Genna and Kerrin gave me away to someone and now they don't know where I am. If you recognize me please contact them as they are worried about me. I was raced under the name Everlasting Daisy... and you wonder why I buck?